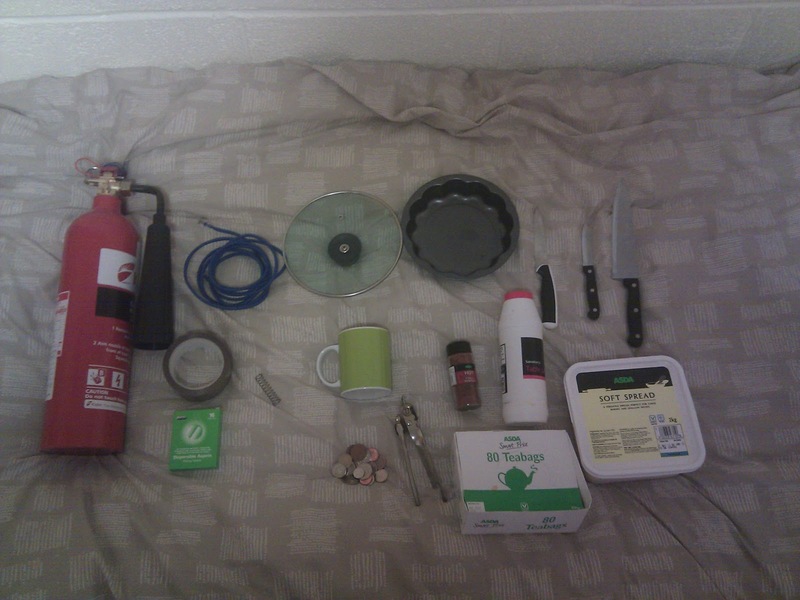 I have been a reader from your blog, I am a student living in on Campus and you contest intrigued me, hence I gathered all I could find to help me in a Zombie Apocalypse. 2- Knives : 3 different length of knives, which put on the end of a stick with tape make either a spear or a small range slashing weapons...yes, I am so dead. 3- Mug : Not to drink, but by attaching the rope to the handle I get a mass over a rope ... rotate to give kinetic energy and smash some skulls. 4- Extinguisher : When full the spray can confuse Zombie, if empty use to smash skulls. 5- Soft Spread : Not it ain't for smoothing certain movements ... it about making some fire, just don't ask me where are the matches. 7- Coins, Can Openers, Aspirins, pepper and spring : Self-aware of my dim chance of survival ... i carry extra items might counterbalance my fear. Editor's Note: Well, this entry wins for "most room for improvement." I know guns are difficult to get a hold of in the U.K., and living in dorms would make the situation worse. However, there are better options out there. A cricket bat, heavy baseball bat (Amazon.co.uk received record orders for bats during the recent riots), or some heavy tools like a wrench or hammer is innocuous enough.